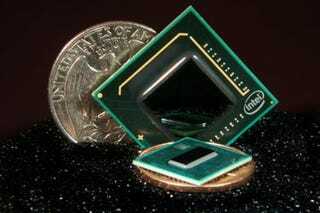 Leaks suggest that Intel will be dropping a new single-core Z-series Atom proc that will be the first of the family to reach 2GHz. Granted, the Z series is the slightly lower-powered single-core chips intended for MIDs, but it's not ridiculous to assume these could find their way into a low-cost netbook or two. The new chips use the same 2.4W as the previous 1.86GHz version, allowing them to be used in the exact same thermal conditions.